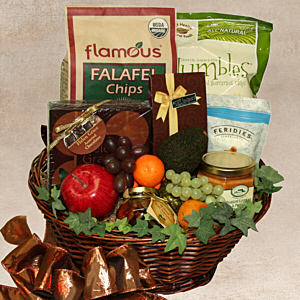 This basket is packed with snacks and gourmet delights that are sure to please. We've included Humbles brand Hummus Chips with Roasted Eggplant Hummus Spread from Rothschild Farms, Feridies Cashews, Honey Soaked Walnuts, Helen Grace Assorted Chocolates, Aunt Gussies Cookies, Flamous Organic Falafel Chips, and an assortment of fruits. All contents are Kosher.